WITH continuous increase in population, Pakistan is facing food security problem since its independence because the main focus of policy makers has remained on staple food crops. On the other hand, such supplies do not meet the dietary requirement of people, particularly those living in rural areas. In such a scenario, there is a need to diversify our cropping pattern from mono-cropping to enterprises which supply essential nutrients in a short duration of time. Such enterprises providing dietary nutrients at a cheaper rate are vegetables. But the adoption of vegetables at commercial level is not satisfactory due to ignorance of different stakeholders and small percentage of cropped area under vegetable cultivation. Therefore, the per capita, per day consumption of vegetable is almost half of the recommended level of 200 grams per person per day. Besides providing crucial dietary nutrients, vegetables generate far higher income than other crops such as wheat, cotton, etc. and low-micronutrient staple food and they help to improve the productivity and sustainability of the cereal-based production system. So, there is a great demand of labour for different agronomic practices and thus, vegetable cultivation generates higher employment at the farm level than cereals. Vegetable production is also influenced by the location of farms due to the fact that farms near to input market are in a better position to purchase different inputs such as seed, fertilizer, etc. at the appropriate time. On the other hand, most of the vegetables are perishable in nature and suffer from less loss if produced near the market. Keeping in view all such factors, the present study had been designed to determine the profitability of summer vegetables on the basis of farm location and its impact on vegetable yield. This study will help the stakeholders, especially policy makers to make the well managed decisions about the formulation of future strategies for the development of the livelihood of vegetable growers. Methods: Vegetables are generally grown in two seasons i.e. summer and winter. Selection of summer vegetables is carried out depending upon their concentration in different areas of the Punjab. The study was confined to the Punjab province only for three summer vegetables (bitter gourd, muskmelon and tinda gourd) which are found in Faisalabad, Rahim Yar Khan, Leiah, Khanawal, and Bahawalpur. The major purpose of the study was to estimeate the cost of production and to determine the profitability of selected vegetables. The cost incurred on land preparation by farmers near to market was considerably higher as compared to that of far from market, since price per tractor hour was high near to city in all three vegetables. In cases where bitter gourd, tinda gourd and muskmelon were planted on raised beds, the time consumed to prepare the beds was also included in the tractor hours. The variety and quantity of seed was an important factor for achieving high yield of vegetables. The costs involved in using the seed among both categories were different. In case of near to market the cost of seed was Rs984.85, Rs167.13 and Rs335.64 for bitter gourd, tinda gourd and muskmelon, respectively. While in case of far from market, the cost of seed involved was Rs890.30, Rs171.44 and Rs361.08 for the respective vegetables. Costs involved in the purchase application of farmyard manure were Rs369.54, Rs111.98 and Rs182.71 for bitter gourd, tinda gourd and muskmelon, respectively on the basis of near to market, while in case of far from market the costs involved in applying the farmyard manure were Rs389.54, 249.28 and 98.68 for the respective vegetables. Most of the sampled farmers used relatively large quantity of nitrogenous fertilizers. It indicated the ignorance of the farmers about various nutrients required by the crop. The cost involved in applying fertilizer by near to market was Rs1830.88, Rs524.92 and Rs2569.82 for tinda gourd bitter gourd and muskmelon respectively. While in case of far from market the above cost was Rs2190.26, Rs594.24 and Rs2110.26 for these three vegetables. Sufficient and timely irrigating a crop improves the yield per acre of any crop. Because vegetables needed more irrigation that was why the costs involved in applying the irrigation was high rather than other crops. Gross income from the cultivation of summer vegetables was higher on farms near to market as compared to those far from the market. The net income per kg was Rs2.75, 1.27 and 0.73 for respective vegetables in case of farmers near to market, while in case of farmers far from the market the net income per kg was Rs2.33, 0.59 and 0.32. Fertilizer is another important input that enhances vegetable yield substantially when applied at proper time. Statistically significant coefficients were determined for all three vegetables. 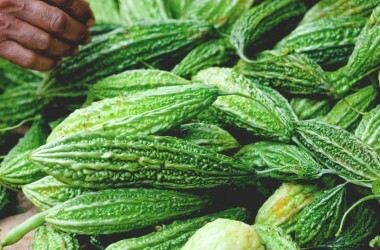 However, percentage effect of fertilizer was higher in case of muskmelon as compared to bitter gourd and tinda gourd because these vegetables needed fewer amounts of inorganic nutrients as compared to muskmelon. Dummy variable for farm size had an expected negative sign showing that as farm size increased, vegetable yield decreased. This was due the fact that vegetable cultivation required a huge amount of financial resources at various stages of production whereas the vegetable growers could not afford such expenditures as farm size increased. For bitter growing farms, this coefficient was statistically non-significant. * Summer vegetable cultivation needs proper amount of irrigation water at different stages. Results of production function indicate that with increased use of irrigation, vegetable yield would increase substantially. Therefore, it is suggested that the farmers should make more and judicious use of irrigation water. * Vgetable growers use the inorganic nutrients below the recommended level due to financial constraints. The results of production function show that fertilizer is significantly increasing vegetable yield. On the basis of these results, the vegetable growing farmers can increase the yield per acre by applying more fertilizer. * Vegetables are sensitive to diseases and insects attacks. Diagnosis of disease and insect attack at the right time is the foremost element in crop management practices. A delay will cause disaster to the crop and ultimately the producer will suffer from this disaster. After diagnosis, the selection and dose of pesticide required for specific attack is the next step in crop management. Consulting with extension staff or any other specialist may help in the right selection of pesticide. * The disease and pest attacks are one of the major constraints in vegetable production. For chemical control of major diseases and insect pest attacks the farmers should follow the recommendation of the Agriculture Department of the Punjab province. Timely, suitable and judicious use of pesticide can help in controlling the above mentioned constraints. Use of resistant or tolerant varieties of vegetables can be viable alternative for farmers for controlling insects or diseases. * Weeds in any crop negatively affect the production. That’s why the vegetable growers using more number of labour hours for weeding and hoeing got higher yields. Herbicides using for weed control is an expensive technique. Alternative to weed control with herbicides include crop rotation, careful and timely cultivation, intercropping to out-compete weeds etc. * The process of information exchange and communication among researchers, extension staff and farmers depends on adequate and timely activities in the area concerned. Critical to the discovery, development, and application of new and resource-efficient farming systems and technologies is their characterization and interpretation in terms which can be easily understood and implemented by farmers. * Marketing as an institution needs to be established on modern lines in the country. Vegetable growers should have access to a large number of consumers. In cities, proper wholesale marketing system should be established. The transport infrastructure is another limiting factor in the marketing of vegetables. As these are perishable commodities, transport infrastructure should be strengthened. * As discussed earlier, vegetable cultivation needs more funds to purchase inputs and perform various farm activities. On the other hand, vegetable growers possess small chunk of landholding, therefore, they have lack of financial resources. So, these farmers need immediate attention of the concerned authorities.